Learning about wind on the highway took up a good part of the year for StFX engineering students Jenny Bowie and Connor McCabe, who hope to use the knowledge to help increase fuel efficiency. The two, who graduated this spring, spent the last year as part of a group of four students in StFX earth sciences professor Dr. Dave Risk’s FluxLab involved with novel wind modelling. The work originated within a project helping advance truck-based gas detection technology, funded by ACOA Atlantic Innovation Fund. The goal was to improve wind measurement with better anemometer placement on the research trucks, and offset calibrations for speed and yaw. Tara Hanlon, who graduates from StFX with a MSc degree this fall, and Meghan Flood, a 2018 engineering graduate, laid the foundational research, and wind work steadily branched out in the research group. 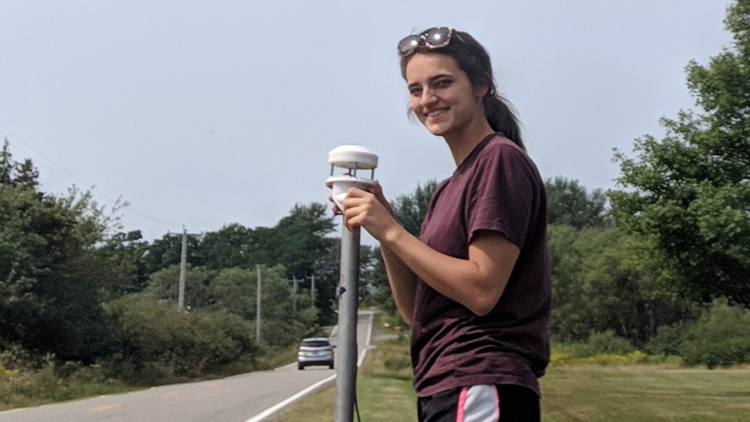 Ms. Bowie, recipient of a 2018 Wallace Family Internship, created a mathematical algorithm to aid in measurement of wind from vehicles and started testing her product on a real vehicle. She’s been working to find the frontal wind speed experienced by a car without the use of an anemometer. Meanwhile Mr. McCabe of Greenwood, NS, recipient of a StFX Student Research Award and University Council for Research (UCR) Award, installed an anemometer on a Classic Freight transport truck that helped map highway winds over two weeks while it traveled 8,000 kilometres. Ms. Bowie says the opportunity to be involved in research at StFX has been amazing. “This is my first time working in a field so directly related to my schooling and it’s a very different experience. It’s really great that the hours you put into working are also hours that make you a better student and give you valuable experience. It has also been very rewarding to see how far my project has come,” she says. Her project involved using data collected from the moving vehicle along with dynamic equations of vehicle motion and an algorithm she’s been working on. This is important because wind speed is the biggest factor that impacts fuel economy. She says the vision right now is to use this technology to help fleet companies to save fuel through a couple possible systems. The biggest surprise of the experience? Learning about all the interesting research going on at StFX, she says. Mr. McCabe’s research has been looking at ways to reduce emissions in the transportation sector by understanding how the wind affects fuel efficiency. “About two thirds of fuel consumption at highway speed is due to air drag, and high wind gusts increase this dramatically,” he says. 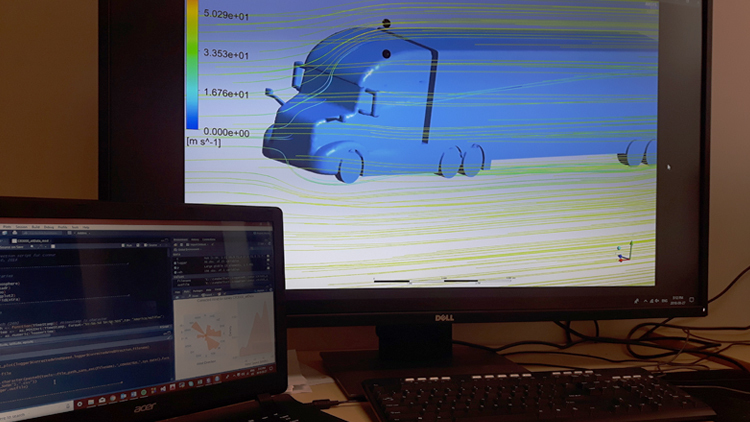 A large part of his work included using a computational fluid dynamics software to model the air flow over a transport truck. This helped in determining a good anemometer location and in ensuring proper wind measurements from that location. He also worked on creating a wind-based cruise control algorithm, which showed potential for fuel efficiency increases of up to 16 per cent. 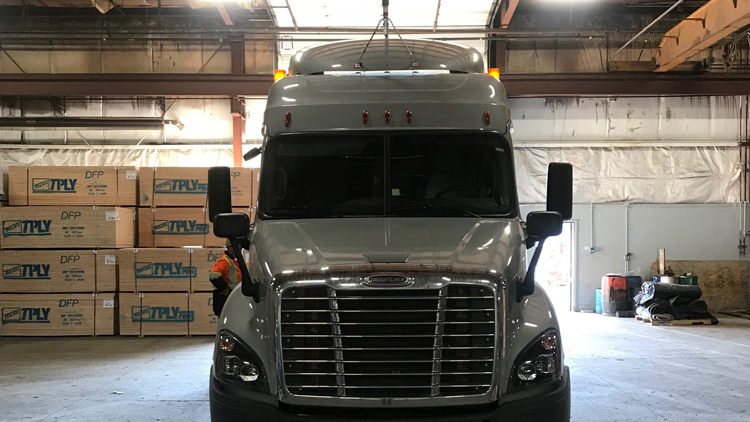 For his field work, he worked with Classic Freight, a freight company out of Dartmouth, NS, to attach an anemometer to measure winds from one of their trucks. The truck travelled around Atlantic Canada for over two weeks, collecting data on wind speed and direction. This data will be used to gain a better understanding of the winds experienced by highway vehicles and how they affect fuel efficiency. “The opportunity to be involved in research as an undergraduate is one that is hard to beat,” he says. “The critical thinking, communication, project management and hands-on skills that I have gained from this experience are ones that I will carry with me throughout my academic career and onward. Research as an undergraduate not only helps you to develop your academic skillset, but it also allows you to better understand and appreciate the scientific method,” says Mr. McCabe who begins his first co-op term as he moves on to Dalhousie University to complete his bachelor’s degree in mechanical engineering over the next three years.